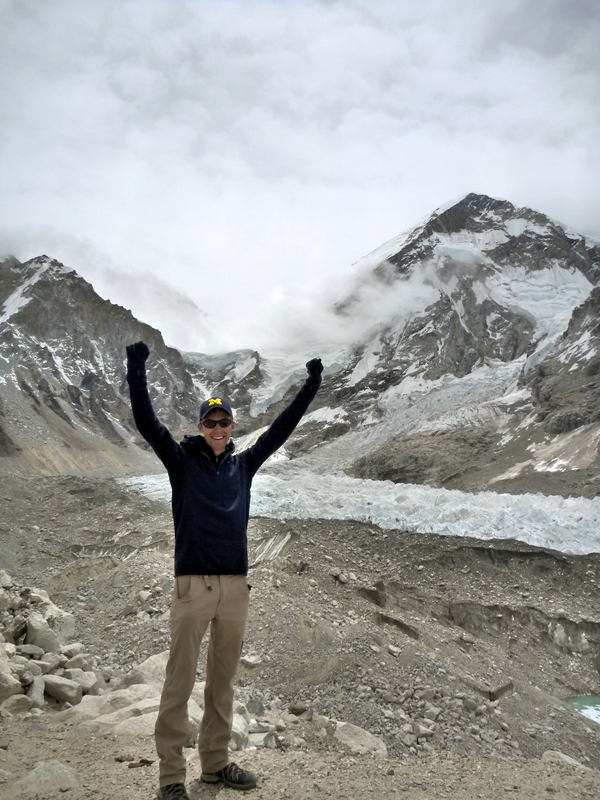 Note: This is an entry in a multi-part account of my June 2014 trek to Everest Base Camp. Navigate the full set here. Following a celebratory breakfast after a successful summit of Kala Pattar, we started the descent. 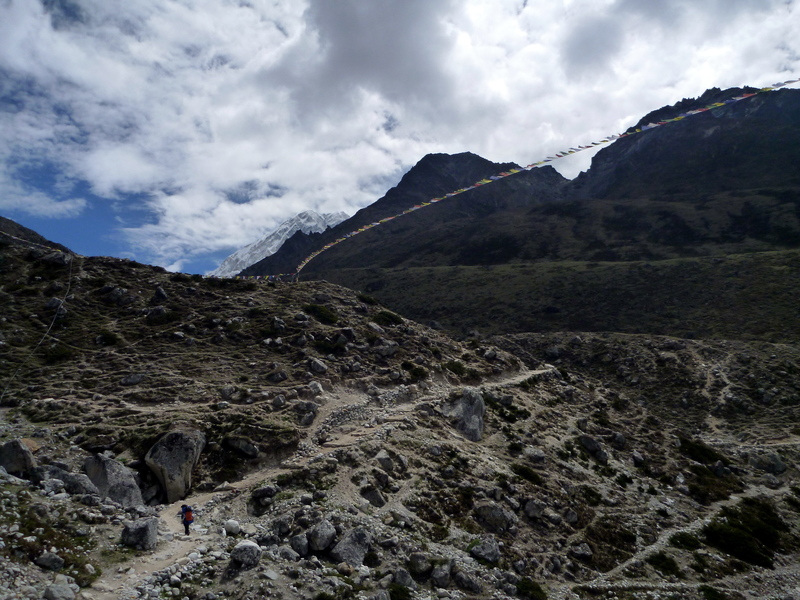 Since we lost a day due to the Lukla flight on the way in, we wanted to cut a day from the descent, so we needed to make it all the way to Pangboche at 3900m. 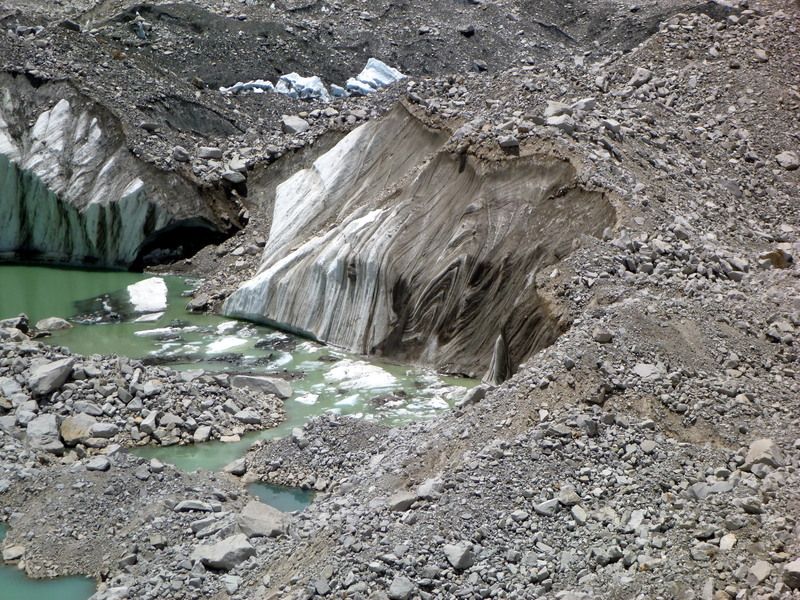 The Gorak Shep-Thukla section looked much different in reverse with no clouds. Stunning! From Thukla to Pheriche was new trail. We descended a fairly steep canyon before breaking out into a huge open plain nestled at the foot of Tabuche. Today is the day! We reach our goal after over a full week of ascending. 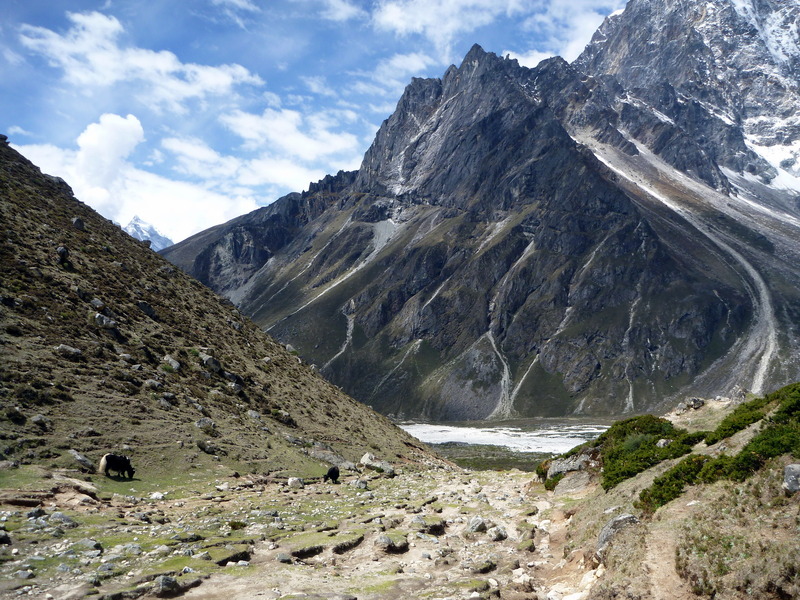 We started from Lobuche in the morning, passing through flat to rolling but difficult glacial terrain on the way to the highest tea house at Gorak Shep (5100m). 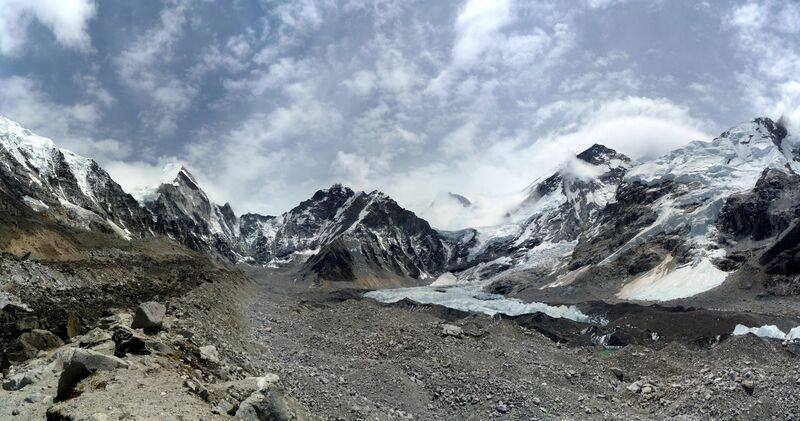 From here we can finally see the crest of the range and the Tibetan border: Pumori to Everest forms a darn impressive looking ridge. 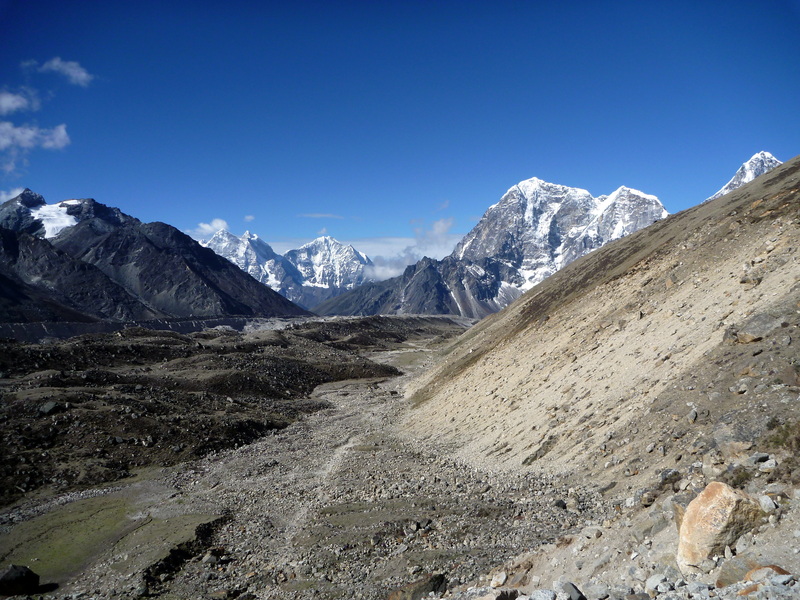 After 2 hours we reached Gorak Shep, where we dropped packs, ate, and got geared up for the Base Camp side hike! 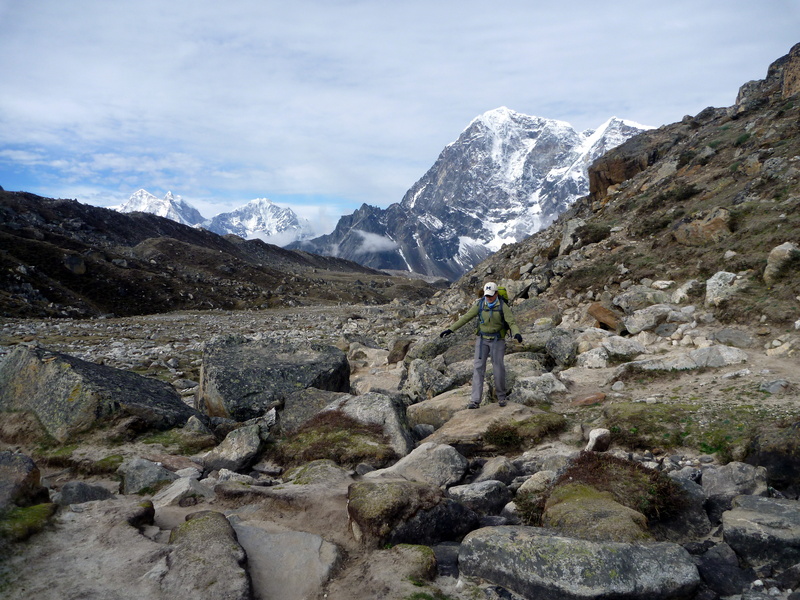 We crossed a spooky dry lake bed before traversing left high to avoid the Khumbu Glacier. 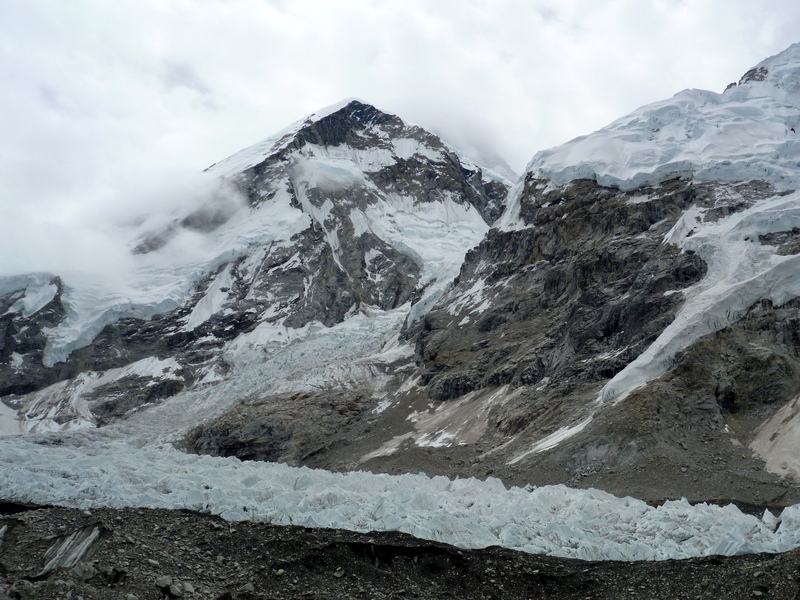 The ice wall of Nuptse rises high to our right. 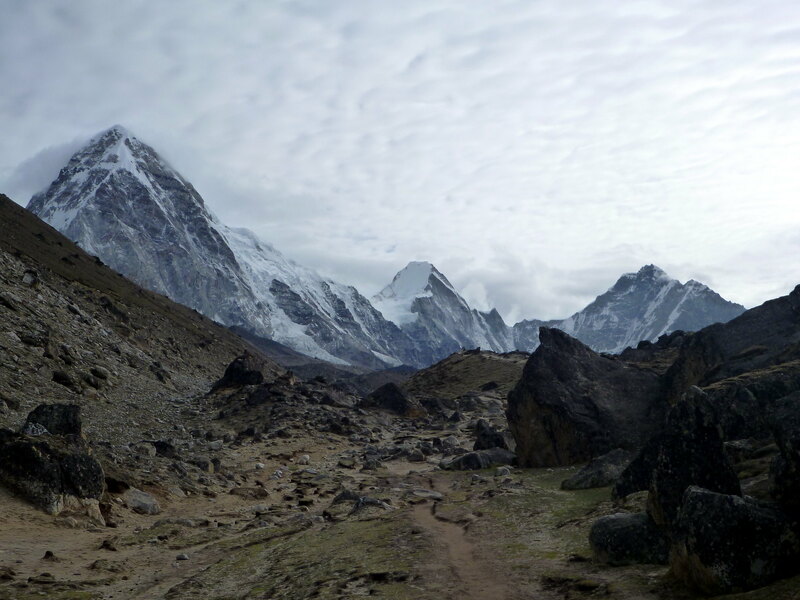 Continuing along rocky terrain, the Khumbu ice fall and the start of the Everest climbing route comes more clearly into view. 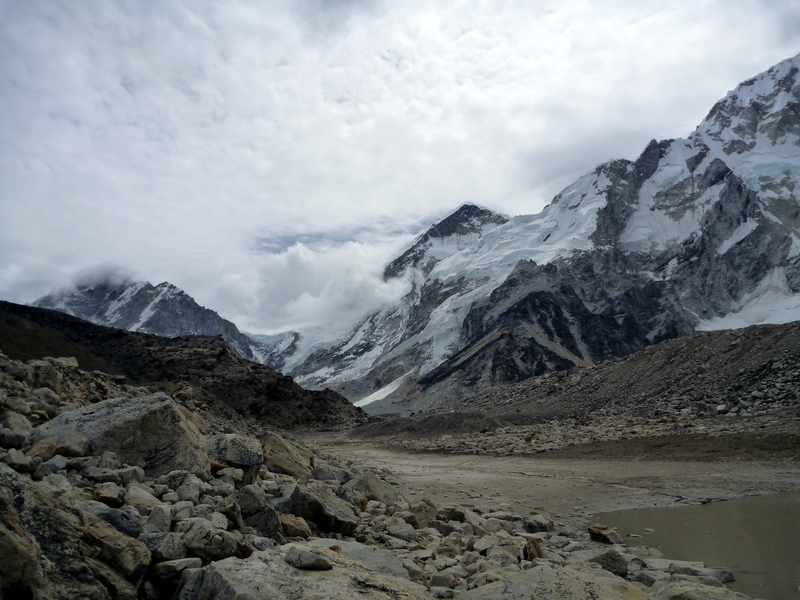 After two hours, we came to a descending traverse to the glacier under a muddy, rocky hill. We were warned “don’t stop!” due to the presence of rockfall danger. I have to admit it is one of the sketchier places I have been in the mountains. 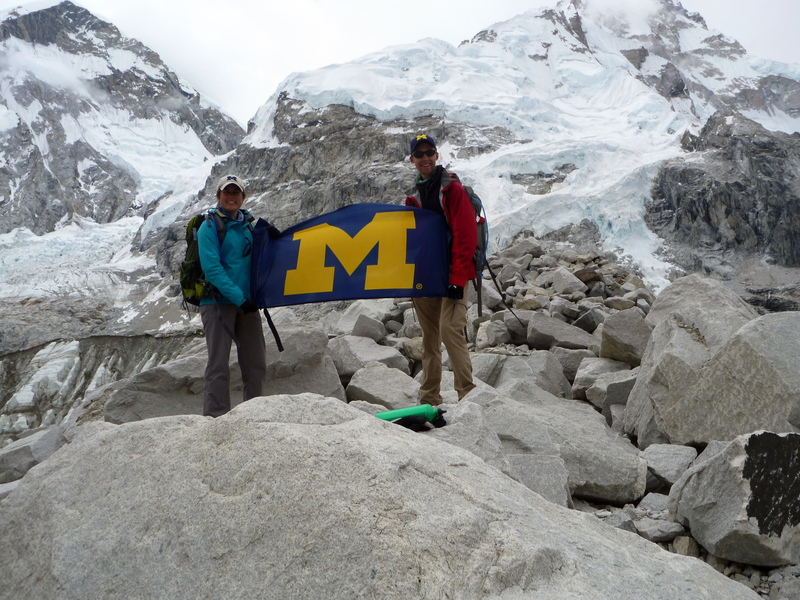 Finally, we came to a point on the glacier where our map was marked base camp. We heard ice and rock chunks falling periodically as the day warmed up. DB decided this is as far as it was safe to go, and we agreed! We got to the spot on the map – mission accomplished! Apparently a bit further on is a small sign and shrine with some stuff people have left, but in the unstable monsoon heat, continuing the risky glacier crossing wasn’t worth it to us. Retreating quickly, we found a better photo op a bit further back with some prayer flags. Overall, Base Camp itself is pretty anticlimactic, but that is what we had been told. Even from the sign you can’t see the summit, and in the non climbing season there isn’t even a tent city to see. 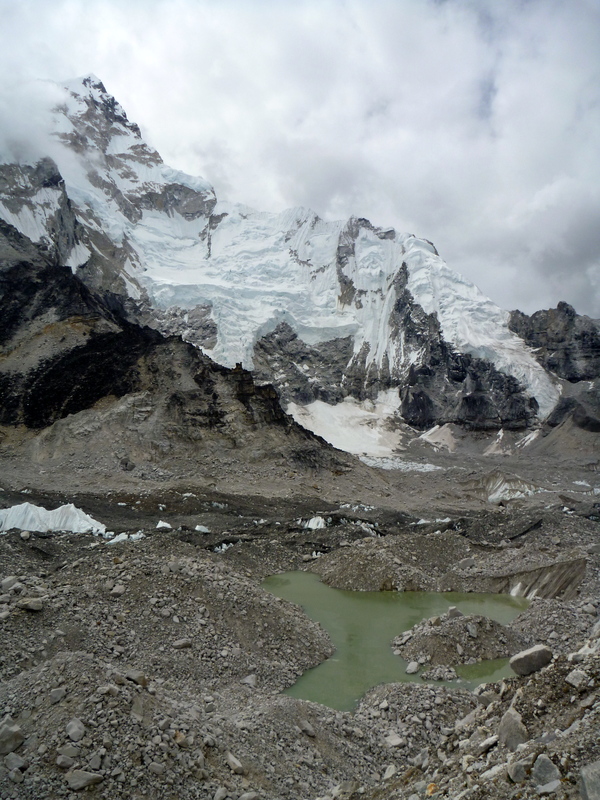 But we saw the ice fall, the Khumbu glacier, and walked where mountaineering pioneers walked. Not a bad day in the mountains. The clouds lifted a bit on the way out, affording even better views! 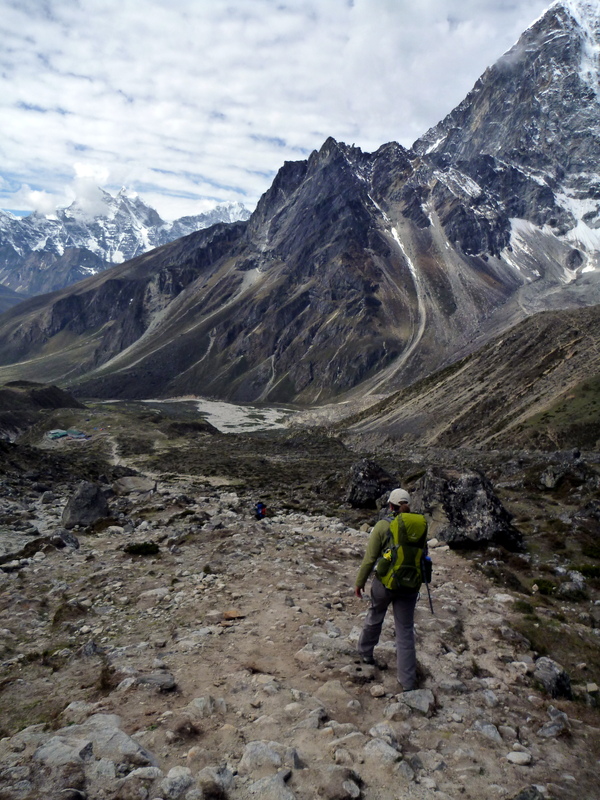 Originally we had hoped to hike Kala Pattar this afternoon if the weather is clear. Unhelpfully, it snowed, so we paid for 30 minutes of slow WiFi to get a “we made it” email to our families. 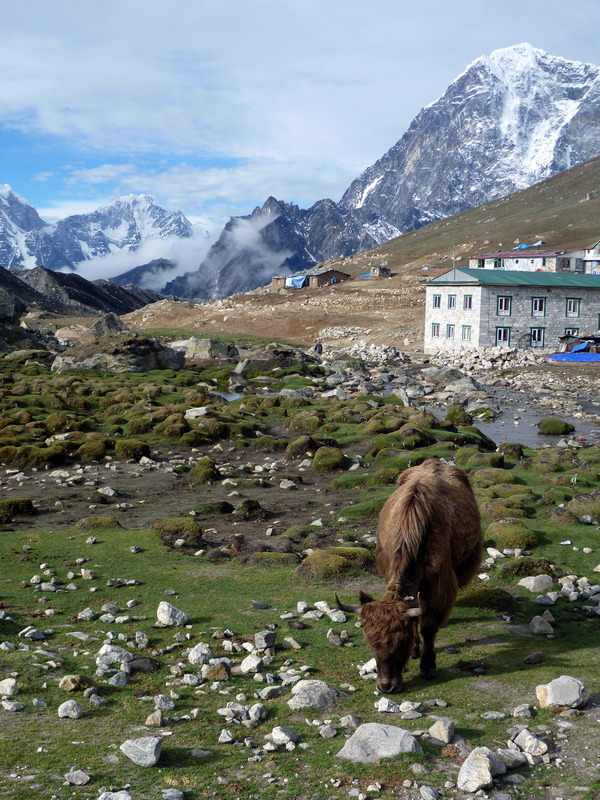 Gorak Shep has the worst food of any place we visited on the trek! Unsurprising, but we were ready to begin the descent the next day. We woke up ready to hike with our warm clothes on at 3:45 and started walking at 4. A coating of snow reflected the full moon light as we started on the first set of steep switchbacks up the scree pile known as Kala Pattar. 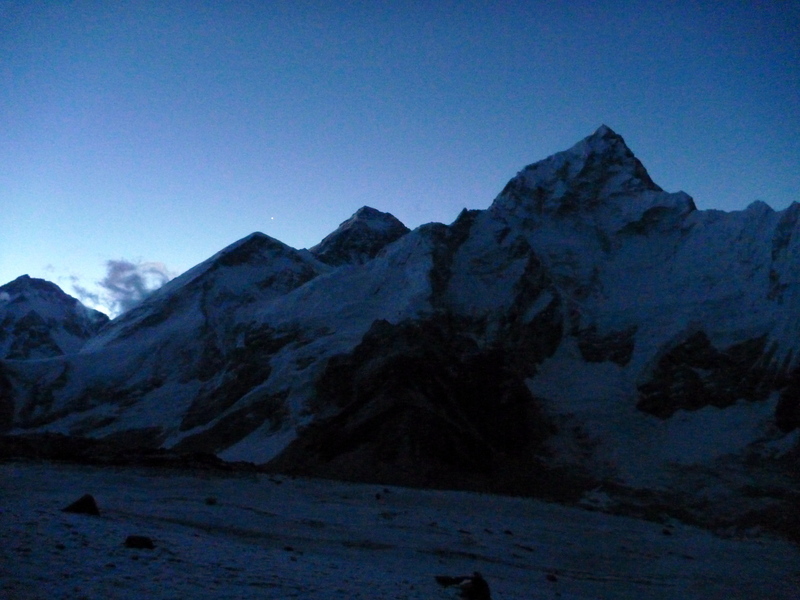 Really a minor sub-peak of Pumori, Kala Pattar is well known as a fine vantage point for Everest’s summit. 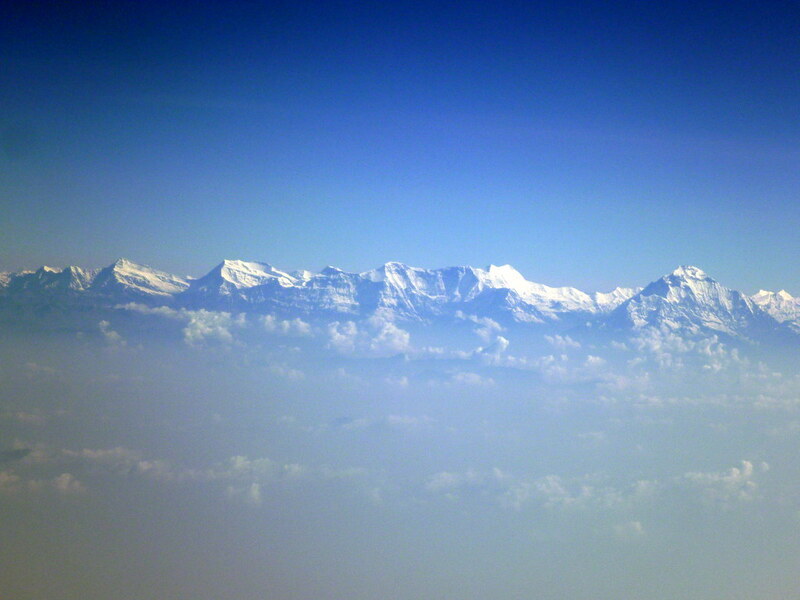 Again, we had clear skies in the morning, giving us our first good view of Kongde above Namche. Unfortunately the clouds came in almost before breakfast was even over. Today’s hike looks easier than it is. 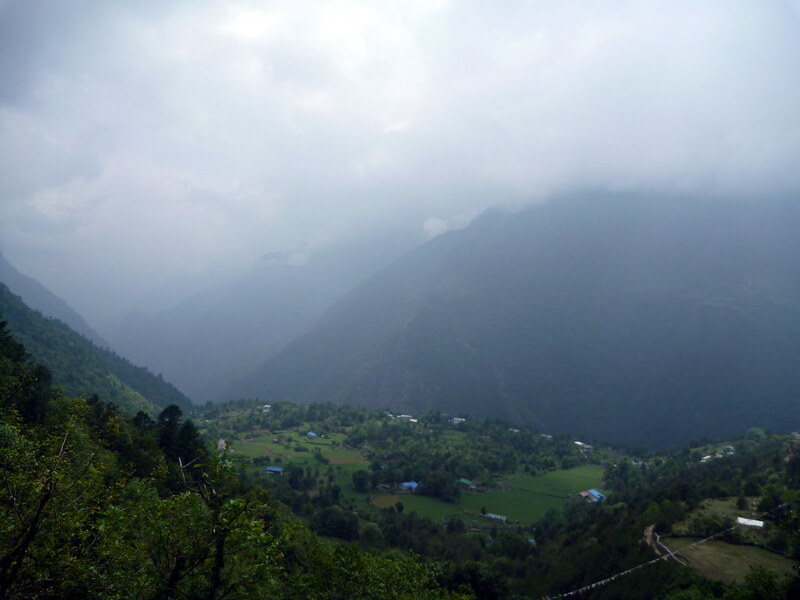 While there are only 400m to gain overall, the day starts with a descent back to the Dudh Kosi losing a few hundred hard-earned meters down to the village of Phungi Thanga. 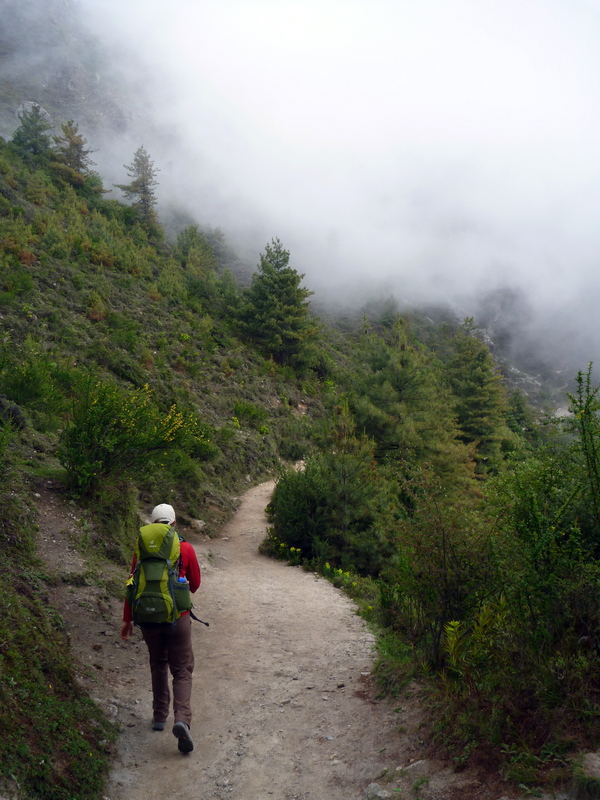 Along the way, the trail is cut into the side of the hill, a scenic hike even in the clouds. 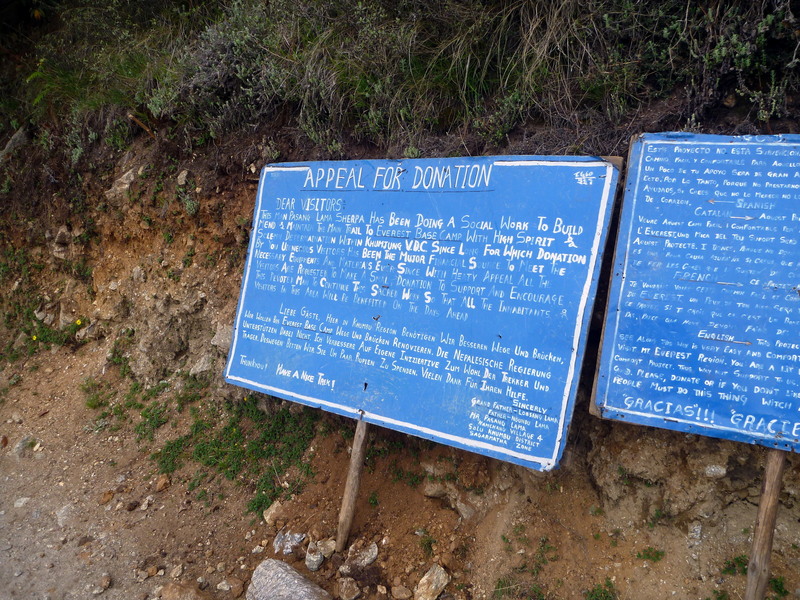 An old man has been building and improving this stretch of trail for many years: he funds the work through donations by trekkers. I have to say, it really is a nice bit of trail! We descended and crossed the river at Phungi Thanga village before climbing up a very steep 600m to our destination, Tengboche. We could definitely feel the effect of the altitude on this section: elevated heart rate and breathing given the level of effort we were putting out. 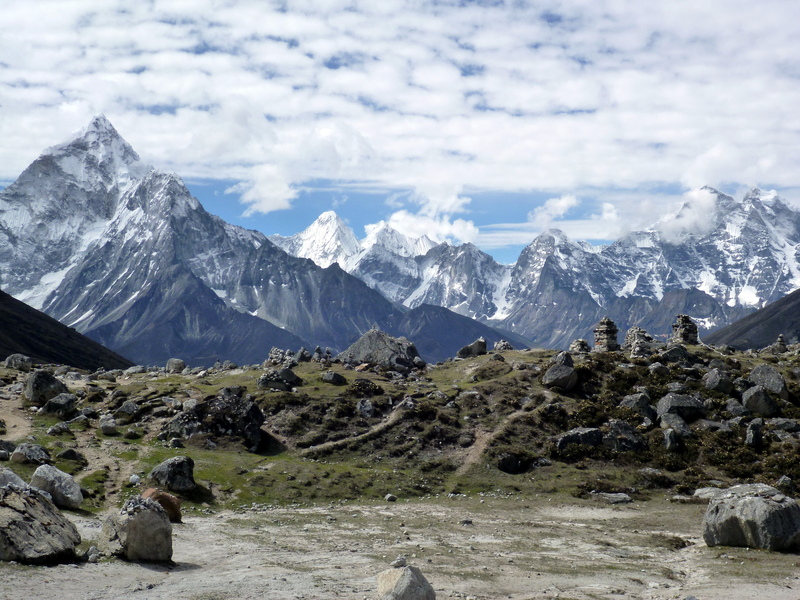 Tengboche is small but gorgeous! 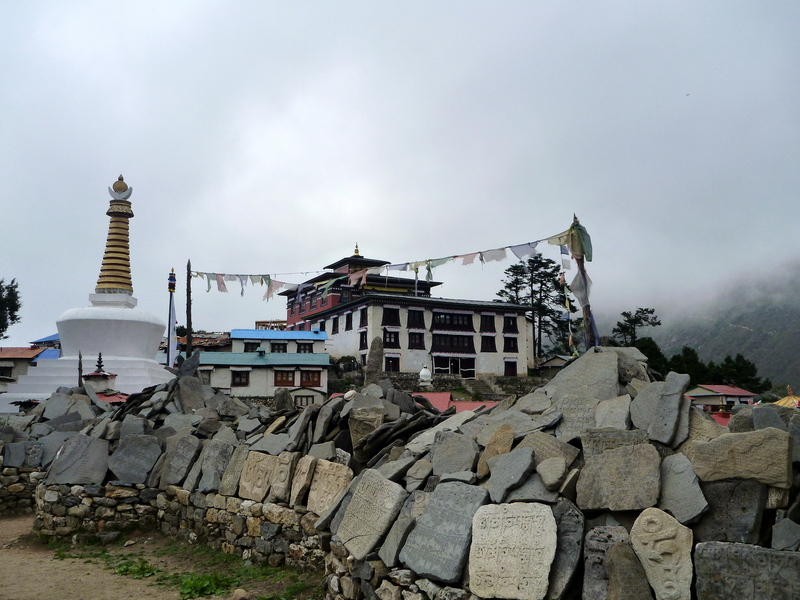 The famous Tengboche Monastery is the notable attraction of the town. 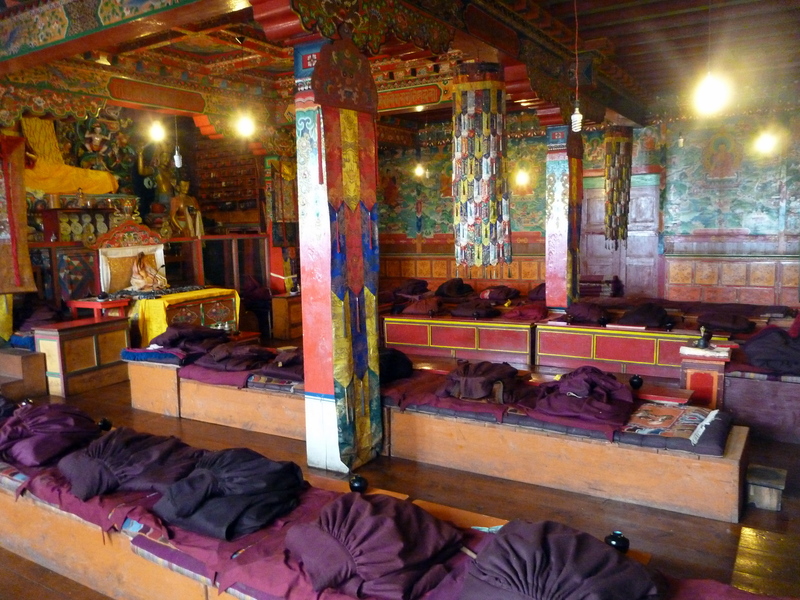 It is a center of Tibetan Buddhist learning and prayer. At around 4pm we heard monks blowing conch shell horns in the window, inviting the tourists inside. 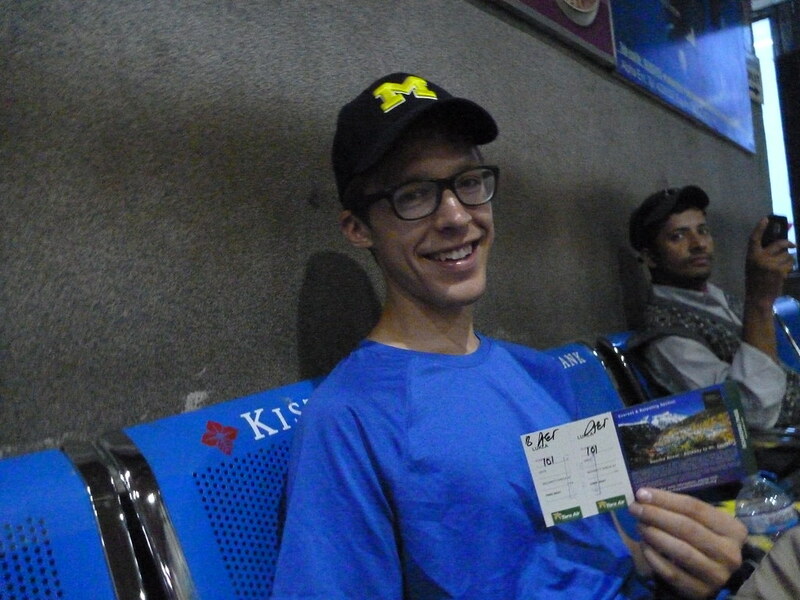 We woke up early again to get on the first flight to Lukla. Yesterday, the flight was finally cancelled around noon. That was not a problem. 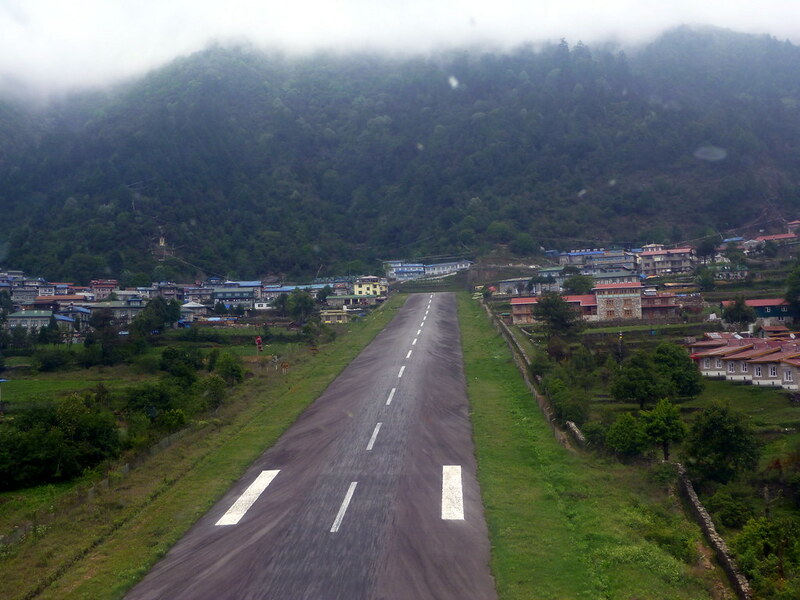 The flight to Lukla is so notoriously unreliable that we built in a few extra days before and after the trek. 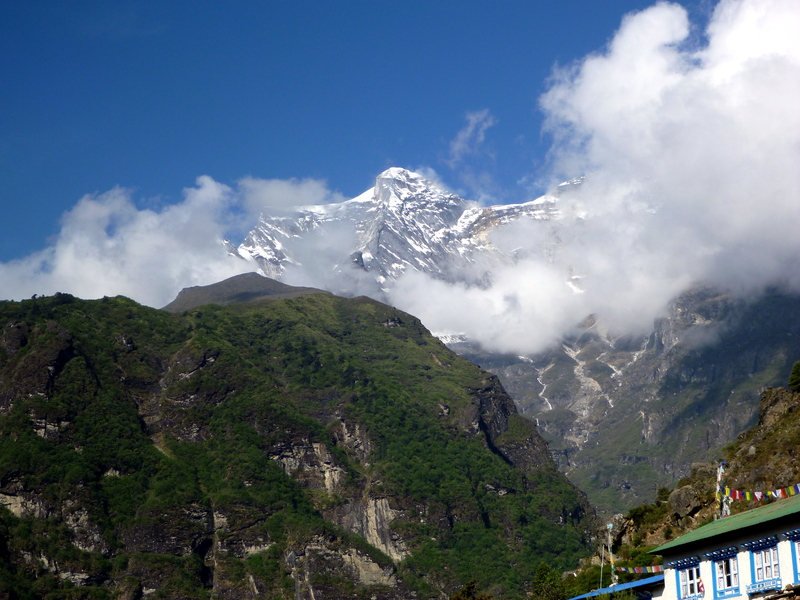 It was like the movie Groundhog Day: one delay was announced after another, and we were sure that we would be trekking to Annapurna Base Camp instead, as our backup plan. However, an unexpected, twisted stroke of luck happened to strike in the form of a rescue. Someone up high on the EBC trek was sick and needed a rescue chopper. The chopper was about to head to Lukla with empty seats when our guide, nicknamed DB, talked our way into one of those empty seats for the same cost as our airplane ticket! 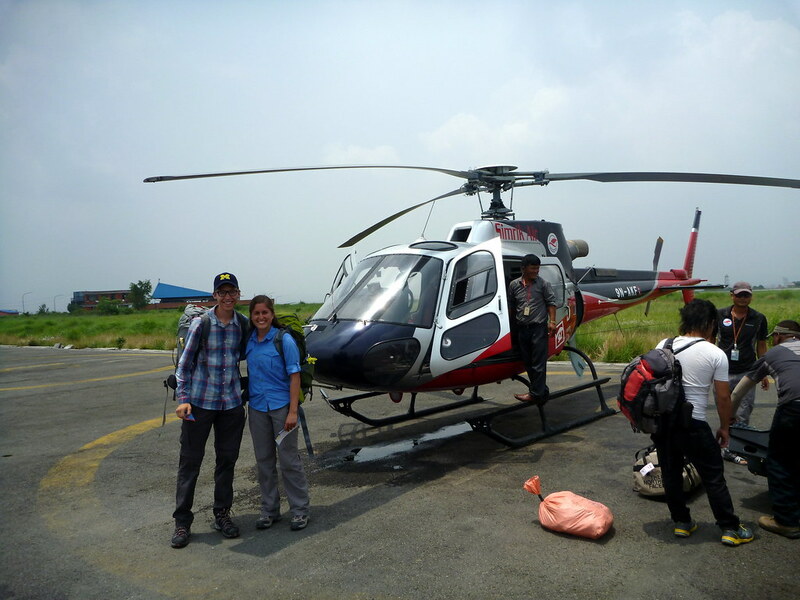 We switched our Tara Air passes for a Simrik Air chopper ticket and could hardly believe our luck. Helicopters sometimes fly in marginal weather because their visibility minimums are much lower than for fixed wing aircraft. Six of us (four westerners, two guides) boarded and we were off! 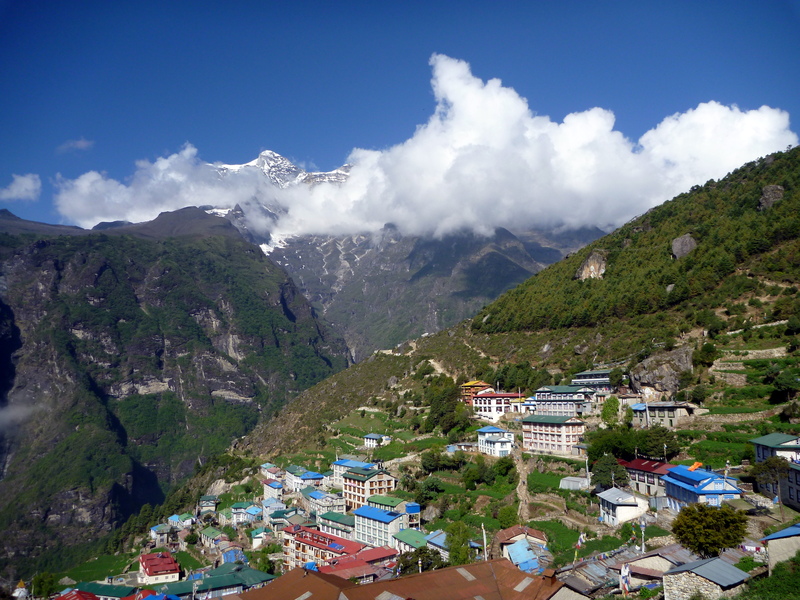 Lukla has earned its reputation as a risky landing for a reason. Its runway is tilted upward at a 12 degree angle. A cliff guards the far end of the runway, preventing any notion of a “go around” in the event of a missed approach. It goes without saying that there are no landing aids. We were happy to be making the landing on the helipad rather than the exciting way. 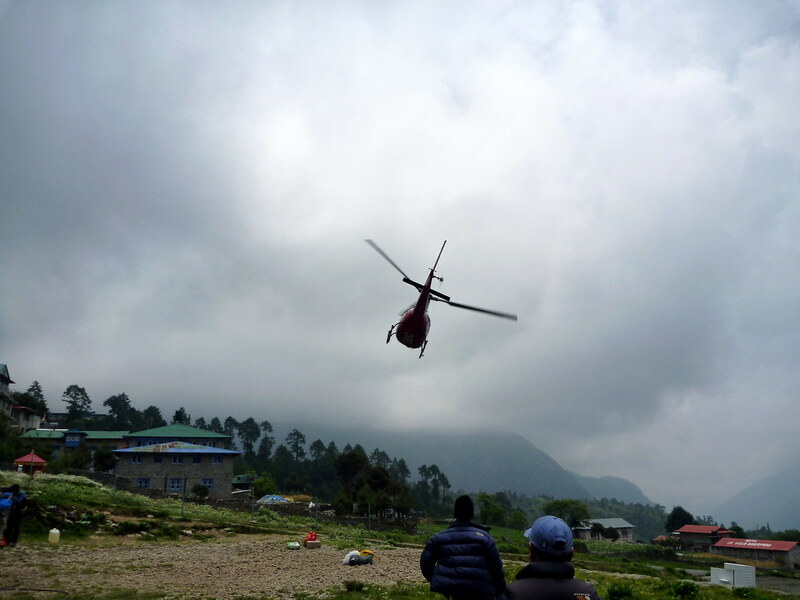 After we carefully unloaded (ducking to avoid the risk of the rotor blades) we watched the chopper fly away. 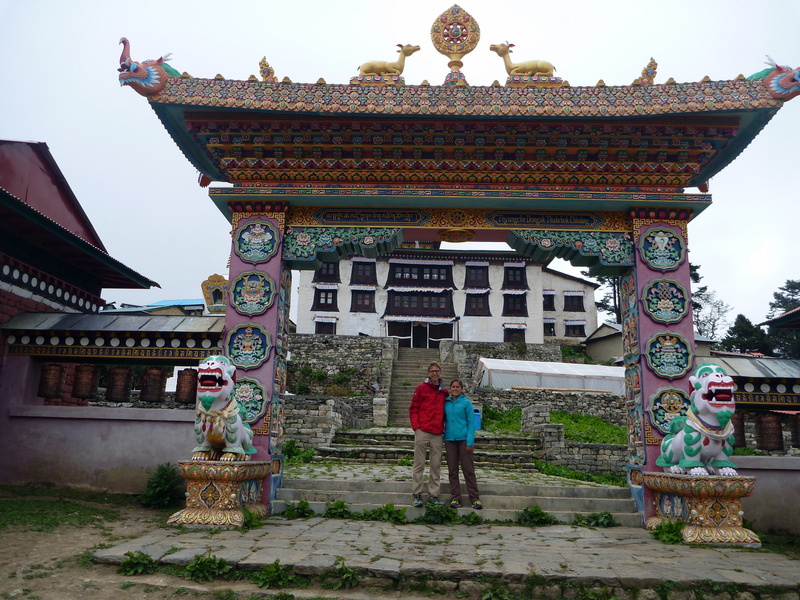 We ate lunch in at the Mera Inn in Lukla but didn’t stay long, starting out down the stone-paved trail for Phakding. The way is mostly downhill, descending about 200m through a few minor villages. The cloudy day lent a gloomy air to the deep valley as we covered the deceptively easy first few miles. 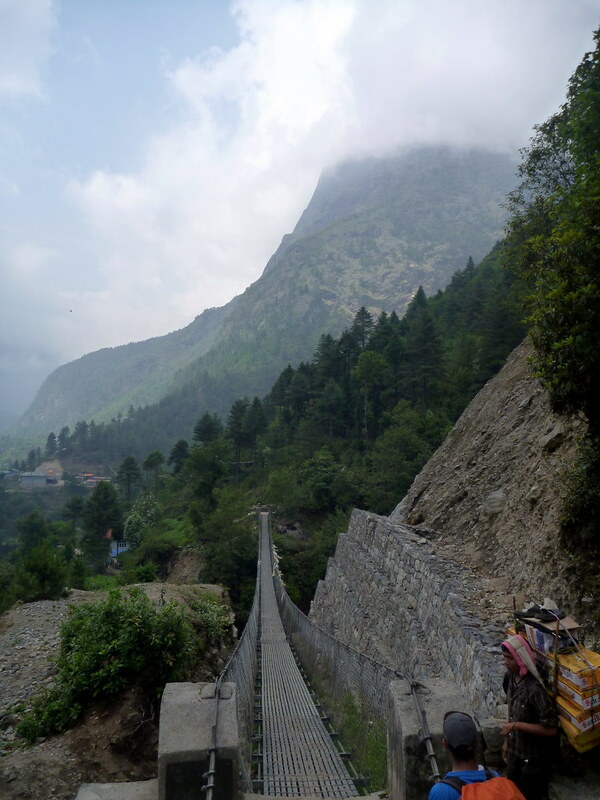 Near the bottom of the valley, we crossed our first steel suspension bridge – a remarkable bit of engineering considering the remoteness of the region. Update: Several of the landmarks described here, notably including Patan Durbar Square, were severely damaged or destroyed in the April 2015 earthquake tragedy. Please consult updated travel references – hopefully the pictures here pay some form of tribute to the beautiful history that was lost that day. Bustling, smelly Kathmandu: capital of Nepal, hub for Himalayan trekking, and my first taste of Asia. The purpose of these first three days in Kathmandu is to make arrangements for my upcoming Everest Base Camp trek and see the sights in town in whatever time is left over. I flew into KTM from Berlin via Doha on Qatar Airlines (excellent service for a low-cost airline) in the morning and caught a free hotel pickup from the Hotel Nepalaya where I’ll be staying for a few days. 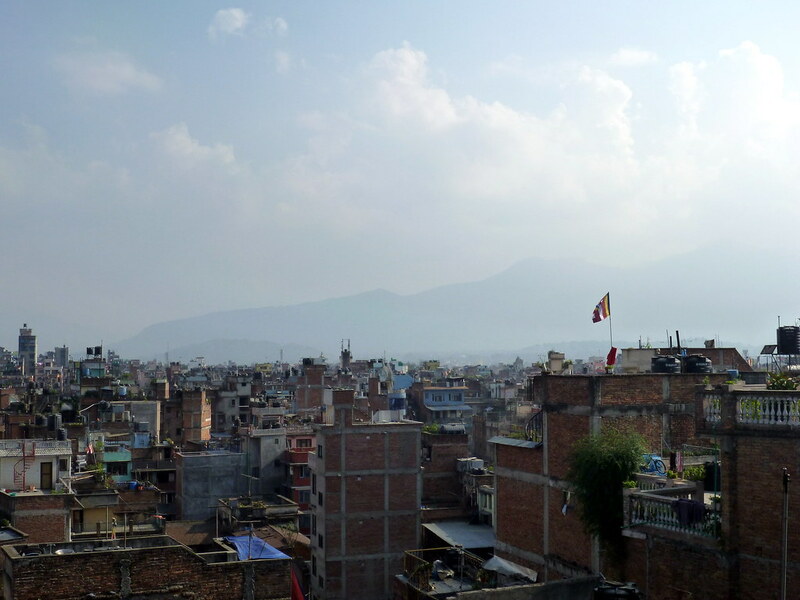 The air pollution in the Kathmandu valley is immediately apparent. While not as bad as certain places I visited in my only previous trip to a developing country (Guatemala), the air is visibly hazy and exhaust burns the lungs a little sometimes when on the road. 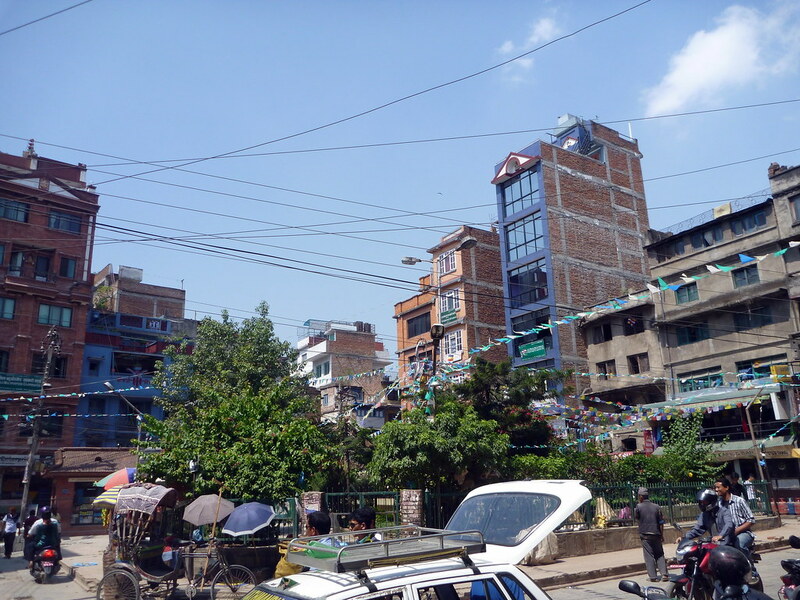 My hotel is based in Thamel, the main tourist neighborhood in Kathmandu. The streets are crowded with rickshaws, taxis, street vendors, touts, and stray dogs, each of which is constantly shouting for your attention. Sidewalks don’t really exist in this part of town so people sort of informally walk in traffic and get honked at if a car needs to go by.